To those who toil away in offices, people who work from home must seem spoiled, as they get to eat gourmet lunches pantless. The reality is shoveling handfuls of dry cereal into your gullet and drinking microwave coffee. Pantless, probably. That part's correct. 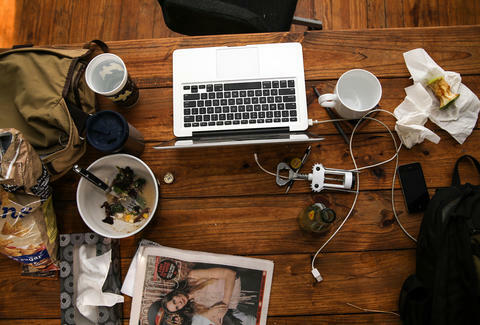 So to give a window into the often pathetic world of withering away at a dining table that's rarely used for dining, we've compiled a list of 14 habits that most telecommuters will be able to shamefully relate to. And if we missed any, let us know in the comments. We won't judge. 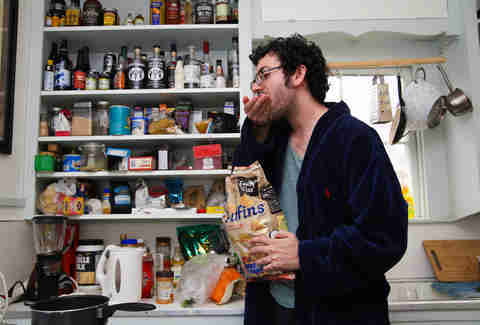 Cereal, peanuts, and chips are all consumed while walking between the kitchen and workspace. You've convinced yourself that these handfuls are somehow a meal. Pocket notebooks, stray pens, iPhone charger cables, and business cards litter the area where you're supposed to be eating. There is also a cereal bowl encrusted with salad dressing or oatmeal. Whenever anyone comes over, all of your work stuff gets shuffled elsewhere. It doesn't move for weeks. Clif Bars! Apples! Stale bread! Crackers! A spoon! Your hand! 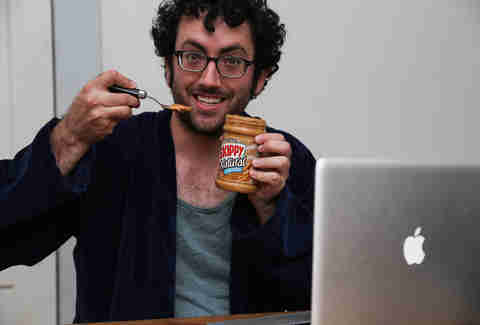 There's no greater satiating commodity than peanut butter. The average American has eaten 1,500 PB&J's by the time they're 18, but there have yet to be any studies on the telecommuter's diet, as no scientist has been brave enough to explore their terrifying habitats. One slice 2-day old frozen pizza, a small clump of pad Thai, 10 leaves of wilting spring mix, and a hard boiled egg does not make for a complete meal. It does make you depressed. That soup sure did sound like a good idea an hour ago when you put it in the microwave. Then you ran back to your computer to send emails during the 2mins it took to cook the damn thing and forgot all about it. 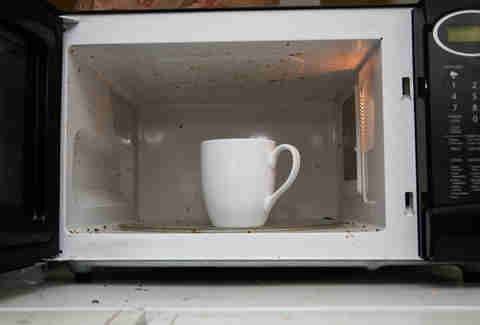 Good thing you can just microwave it again! 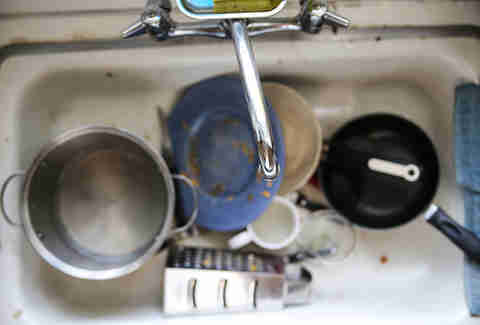 Should you be responsible enough to make a decent meal, it actually just creates more work in the way of cleaning. There's no need to dirty a plate with fried chicken grease or quesadilla crumbles when you can lean over the sink, close your nose to avoid sponge smells, and dig in! Eating off of paper towels is also acceptable. Thanks to that fried chicken and handful of peanuts, your keyboard is now a Slip 'N Slide for your fingers. It also becomes a rich source of crumb-based sustenance. Neither a Clif Bar nor an apple is an actual meal, even if you put peanut butter on them. Working from home requires a constant stream of caffeine. Coffee is a reward, scapegoat, and appetite suppressant all wrapped into one, but it's likely those very highly ranked fair trade beans are going to waste because you'll be drinking it lukewarm at best or, at worst, sinfully microwaving away all the flavor. How many times can you make noon lunch plans and not be free until 1:30 before everyone you know stops believing in your ability to show up to a damn sandwich shop? Alternatively, this leads to often eating lunch out alone. Bring a book. The bottom of a bag of chips, the rinds on fancy cheeses, the sugary remains of a bag of honey peanuts. These last bits of sustenance do little to stave off hunger. You eat them anyways. They make a leftover medley look like Thanksgiving dinner. Any office manager will happily tell you to clean up your damn cubicle, but when you work at home your office manager is a lot more forgiving. And good looking. Because it's you. Dishes pile up, the discarded remains from taste-tests crowd your counters, and, before you know it, you're using your girlfriend's March issue of Vogue as a plate. Avoiding rush hour shopping as a perk, but if you're going grocery shopping during the day, you're probably just making the excuse that you can eat an affordable lunch there. Instead, you buy a bunch of vegetables that eventually go bad and seven Lean Cuisines that you finish two days later. Although it's easy to scarf down the official breakfast of a lazy person trying to be healthy (banana + a cup of water), it's likely that your morning meal doesn't come before noon. And if you're going out to lunch, you've gotta race to make it before the restaurant closes to prepare for dinner service, and pray they're pretty lax about people eating pantless. Dan Gentile is a staff writer on Thrillist's national food and drink team whose terrible eating habits would disqualify him from joining just about any other food and drink team. Follow him to piles of dirty dishes and handfuls of peanuts at @Dannosphere.